If you've been watching AMC's riveting series about zombie apocalypse, the Walking Dead, then you're probably into blood and guts like me. You might also be watching because you're interested in the moral dilemmas that the characters face during each twist and turn of fate. As the misfortune adds up and the body count rises, some of the most honest and trustworthy people must do some pretty terrible things all in the name of survival! That makes for some pretty great television. When I was watching the opening to season 3 this week, I couldn't help but think about how much the zombie apocalypse genre of television and cinema can teach us about oxytocin. That's right, we can learn more about the mislabeled "cuddle hormone" by thinking about both the benevolent and terrible things that people do in the name of survival. Oxytocin is a neuropeptide of nine amino acids that is produced primarily in the brain (the hypothalamus to be exact) and released into both the brain and the bloodstream. Oxytocin has captured the interest and imagination of scientists throughout the world because it influences many systems of the brain and body. Oxytocin acts as a neurotransmitter, and binds to parts of the brainstem, hippocampus, and amygdala. It also binds to the spinal cord, influencing aspects of the parasympathetic branch of the autonomic nervous system (the part of the nervous system that slows down the heart). Early research on oxytocin touted its influence on social affiliation, trust, and compassion. Mothers tend to experience elevations in blood plasma oxytocin when holding their infants or when breastfeeding them. People higher in blood plasma oxytocin tend to be more cooperative--they give more money to strangers in laboratory interactions. Other more recent research suggests that people with larger numbers of the oxytocin receptor gene (e.g., more receptors in the brain for oxytocin to bind to) tend to be better able to read others' emotions in subtle micro-expressions surrounding the eyes relative to people with fewer oxytocin receptors. This initial work led to an overwhelming surge in the popular and scientific communities suggesting that the secret to love, trust, and enduring social bonds had been discovered. Ultimately, it was argued by several researchers (probably too forcefully) that oxytocin is the single hormone responsible for sympathy in our species, and as Charles Darwin points out "Sympathy, will have increased through natural selection, for those communities, which included the greatest number of the most sympathetic members, would flourish best, and rear the greatest number of offspring." Using this logic, oxytocin seems to be the secret to our survival. That's a nice and tidy equation: sympathy = oxytocin = survival. Unfortunately, reality is never that simple. First, it's clear that survival depends on more than just sympathy, and the writers of the Walking Dead zombie documentary television series have made that one of their clearest messages. 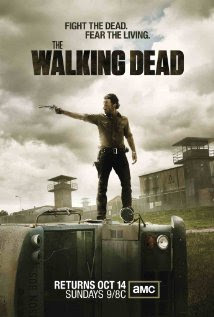 The second season is gripped with tension between the philosophies of the two primary characters: Shane's "Do whatever it takes to ensure survival, moral or otherwise" approach vs. Rick's "Do the right thing, no matter the risks." philosophy. At times, many of the characters waver back and forth in their favoring of these approaches to survival. 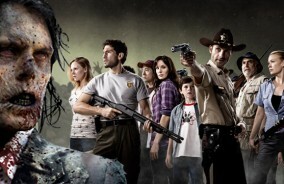 This tension culminates in the second to last episode of the season, when the characters come together, as winter approaches, to vote on whether or not a young stranger should be set free or murdered in order to protect their limited resources. There isn't a whole lot of room for sympathy in the Walking Dead, as scarce resources make one-sided generosity towards strangers much more costly, and much less adaptive. Charles Darwin knew this as well, and he suggests further that survival isn't just about sympathy. Rather, Darwin argues that "groups with a greater number of courageous, sympathetic, and faithful members, who were always ready to warn each other of danger, to aid and defend each other... would spread and be victorious over others." For Darwin, survival is also about what is called parochial altruism--sympathy for and protection of people from one's own tribe or social group. Thus, parochial altruism might even lead individuals to engage in antisocial or aggressive acts toward strangers, all for the good of more vulnerable members of one's social group. The idea of parochial altruism calls into question the usefulness of a "cuddle hormone:" being indiscriminately trusting and cooperative is the surest way to get oneself eaten by zombies! That's Shane's point of view throughout the entire second season of the Walking Dead. Lucky for us, oxytocin isn't nearly as cute and cuddly as people make it out to be, especially when considered in judgments of out-group members. In a collection of several studies, Carsten De Dreu and colleagues (2010) administered oxytocin or placebo through nasal spray to male participants (oxytocin can induce labor in pregnant women, hence the gender restriction) and had them engage in a number of economic decision tasks with in-group and out-group members. The question here was simple: Would oxytocin increase uniform altruism, or parochial altruism--focused toward in-group members? The results were unequivocal--oxytocin increased parochial altruism. In one study, participants contributed to a pool of shared resources for members of their group, or another group. 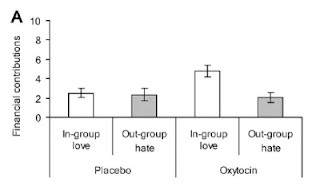 Participants administered oxytocin contributed more money to the in-group and gave no more money than placebo participants to the out-group. In a second study, oxytocin and placebo participants played similar economic games (a modified prisoner's dilemma game) with a computer simulated out-group member, where both participants and out-group target could choose to cooperate or compete with each other--under conditions of low v. high fear. Specifically, if participants cooperated with an out-group member, who in turn chose to compete, the money earned for the participant would be either severely restricted (high fear), or slightly restricted (low fear). Basically, if I choose to cooperate with you and you compete with me, I either get 20 cents to your $1.40 (high fear) or 50 cents to your $1.10 (low fear). In high fear conditions, oxytocin administered participants were significantly more likely than placebo participants to choose to compete with the out-group members, to say that they were protecting their in-group with these decisions, and to expect fellow in-group members to do the same! As viewers watched Shane and Rick come perilously close to murdering each other in their continuing philosophical conflicts on the Walking Dead, I couldn't help but think about the mislabeled "cuddle hormone." It's not that Shane or Rick lack oxytocin, in fact, the opposite could be the case--after all, survival depends on hormones that enhance the protective instincts of individuals in competitive social encounters, as well as their altruism. What are your blood plasma oxytocin levels, and are you concerned about the zombie apocalypse like I am? I'd love to hear more about what you think about the cuddle hormone (or zombies) in the comments. Riveting? Really? Man, you don't stay in much to watch TV. If we're talking neurotransmitters, I'd go with Dopamine. That is all. Is there a feminine side to dominance?